← How Can I Help YOU? Physician coaching looks at service. Last week I had the opportunity to speak about communication to a large group of family physicians. 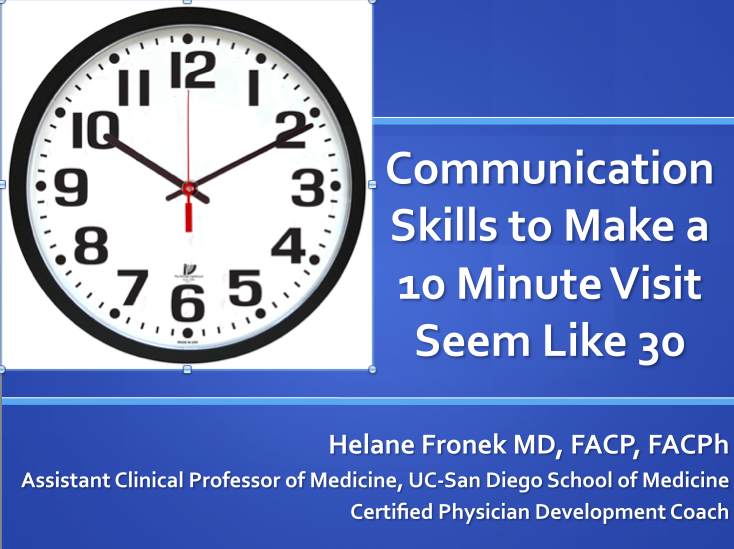 Given that primary care doctors are pushed to see patients in ridiculously short visits, I titled my talk, “Communication Skills to Make a 10 Minute Visit Seem like 30.” As a physician coach, I work with doctors who are frustrated by the limited time we’re given to see patients and with the increasing demands we need to satisfy during those short times. My aim was to present quick ways of developing rapport and gaining a patient’s trust, managing patients’ concerns within the context of a short visit, and explaining a patient’s condition and treatment plan in a way he or she can understand and remember. The skills are simple to implement, such as introducing yourself to everyone in the room whenever you see a patient. “You can be sure that anyone in the room is important to your patient – by acknowledging them, introducing yourself, and including them in the discussion, you show respect to your patient,” I suggested. At the end of the talk, several people told me it was “the best talk of the day.” I was happy and flattered. It always feels good to accomplish your goals and contribute to your profession. But what was striking was that many of the people told the same story – they appreciated what I said precisely because, as family members accompanying their loved one to a medical visit, they had been ignored by the doctor. It reminded me of the time I took my father-in-law to the emergency room. A man walked in, pushing a large piece of equipment. He asked me how old my father-in-law was. Then he asked my father-in-law what his name was. Without a word of introduction or explanation, he began to attach ECG leads and run an ECG. As physicians, we understood the benign nature of the test. If we had been laypeople, we might have been terrified. As physicians struggling to provide care for patients in a system that seems to value “productivity” over conscientiousness, in which patients “rate” us based on the magazines in our waiting rooms and the time they spend waiting rather than on our competence, and where we must keep up with various “meaningful use” parameters and navigate computer systems designed by engineers and technicians rather than doctors, it’s easy to become disillusioned. But these challenges make it even more important to hold onto a sense of humanity – ours and our patients’. Simple gestures such as introducing ourselves, welcoming everyone in the room, and making sure everyone is comfortable go a long way toward establishing caring relationships that help patients trust us enough to share what’s really concerning them. And when that happens, we know that the many hours spent acquiring the necessary knowledge and skills were worth it, as we really do have an opportunity to make a difference in the lives of our patients and their families. And that’s why most of us went to medical school in the first place. This entry was posted in building relationship with patients, Doctor Coach, physician coach, physician coaching, physician communication and tagged Building relationship with patients, communication in healthcare, medical career, patient satisfaction scores. Bookmark the permalink.